Jacksonville University is constantly looking for ways to provide more prepared graduates to growing areas of our local economy. With the success of Florida-based Acosta, Bi-Lo Winn Dixie, Publix, Sysco, and Beaver Street Fisheries, the Davis College of Business has responded to increased demand for Southeastern talent by introducing its first graduate-level consumer and service marketing concentrations. Formerly, all MBA students were required to take one marketing course as part of the graduate core. Now, students will be able to choose a “Consumer Goods & Services” concentration, which will consist of three additional courses including consumer behavior, purchasing practices and promotional strategy. Doctoral students can focus their dissertation and coursework on consumer or service marketing as well. 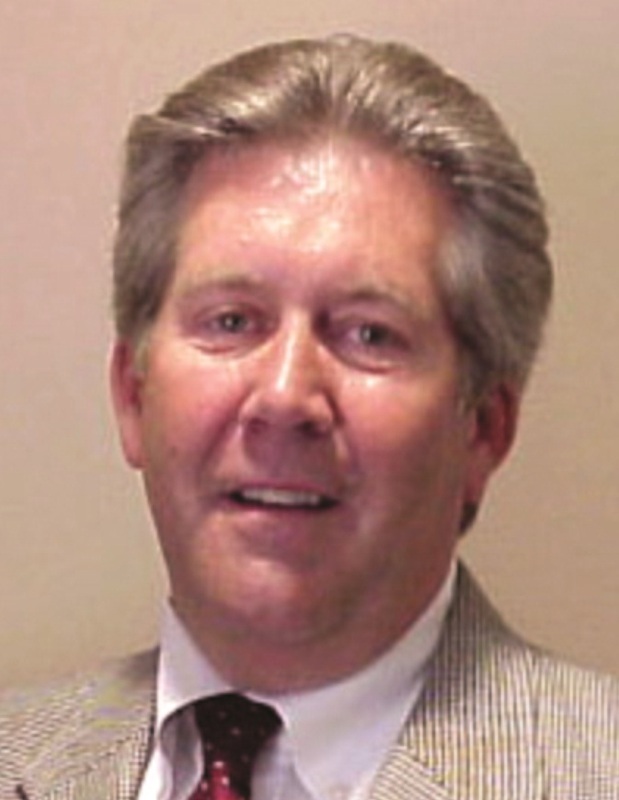 The idea for the new graduate program stemmed from JU Trustee Bruce Kern, CEO of Logix3 LLC, who recognized the national demand for specialized programs in consumer goods and services. Kern teaches a summer course at St. Joseph’s University (SJU) in Philadelphia. The nationally renowned Food Marketing program at St. Joseph’s has produced numerous industry leaders, and trains thousands of sales and marketing employees. A number of stakeholders for the Davis College of Business felt that a marketing curriculum would be important, and consumer goods and service firms in the Jacksonville area backed the program. Kern has spoken with many business leaders in the Jacksonville area, at Bi-Lo Holdings-Winn Dixie, Acosta Sales & Marketing, Kehe, and Sysco. Overwhelming support for the program has allowed the Davis College of Business and Jacksonville University to move forward to launch the new program in fall 2015. JU President Tim Cost, left, with Commencement keynote speaker Gary Chartrand. 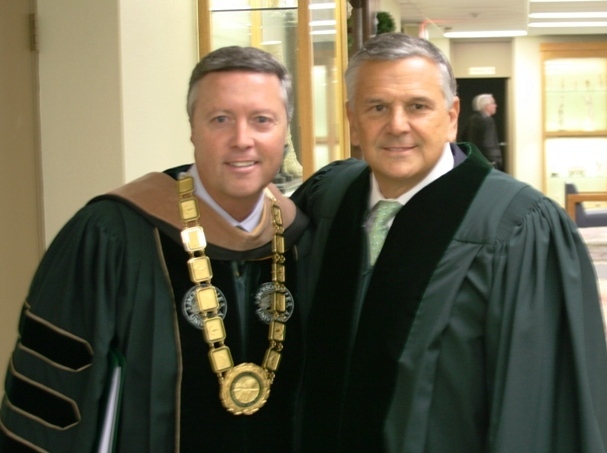 JU already has connections with the consumer goods arena, including at the very top with President Tim Cost, former Executive Vice President of PepsiCo, and also with Gary R. Chartrand, Executive Chairman of Acosta Sales & Marketing, who was the University’s December 2014 commencement speaker and sits on the JU Public Policy Institute’s Board of Advisors. 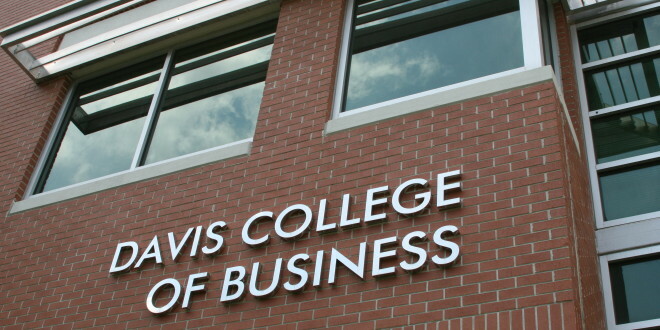 Since achieving international accreditation from the Association to Advance Collegiate Schools of Business (AACSB) in 2010, graduate program enrollment has grown to more than 250 students in fall 2014 between the five different programs available through the Davis College of Business. This growth has put graduate enrollment even with nearby AACSB-accredited programs. Currently, the addition of the MBA concentration is the first step, with the possibility of expansion into the Executive Master of Business Administration (EMBA) program, and as a focus in the Doctor of Business Administration (DBA) program as well.